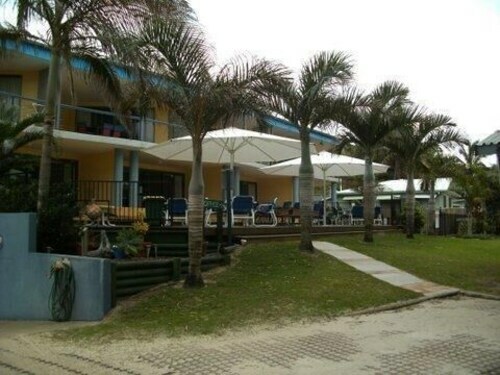 This Fraser Island hotel is on the beach, 0.4 mi (0.6 km) from Great Sandy Strait, and within 9 mi (15 km) of Lake McKenzie and River Heads Ferry Dock. Seventy-Five Mile Beach and Hammerstone Sandblows are also within 12 mi (20 km). This family-friendly Fraser Island hotel is located by the ocean, 0.4 mi (0.6 km) from Great Sandy Strait, and within 9 mi (15 km) of Lake McKenzie and Central Station. Seventy-Five Mile Beach and Hammerstone Sandblows are also within 12 mi (20 km). Situated by the ocean, this hotel is 0.1 mi (0.1 km) from Seventy-Five Mile Beach and within 9 mi (15 km) of Eli Creek and Maheno Shipwreck. Hammerstone Sandblows and The Pinnacles are also within 12 mi (20 km). Offering direct access to the beach, this Fraser Island apartment building is 0.1 mi (0.1 km) from Seventy-Five Mile Beach and within 9 mi (15 km) of Eli Creek and Maheno Shipwreck. Hammerstone Sandblows and The Pinnacles are also within 12 mi (20 km). Wotif lists no hotels within Fraser Island itself, however we have a good selection of great places to rest your weary head in the vicinity. Within 30 kilometres of Fraser Island, visitors can choose from around 37 hotels. 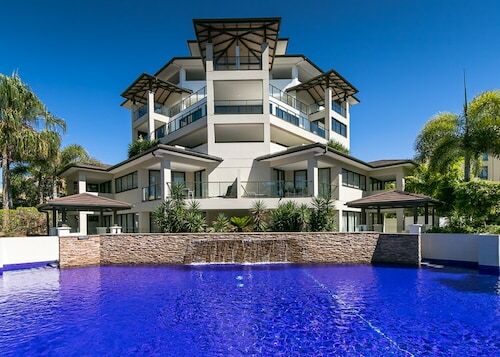 The Oceans Resort, an Ascend Hotel Collection Member, Queensland, which is the nearest accommodation, is 25 kilometres from downtown Fraser Island. 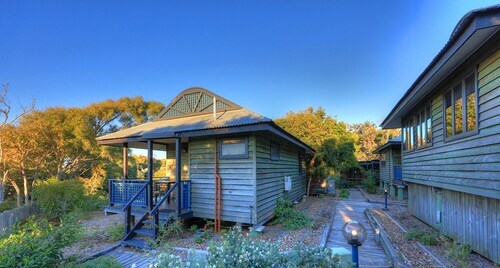 Alternatively, check out the Sanctuary Lakes Fauna Retreat, located in Queensland, which is 25 kilometres away. You could try the Grange Resort as well as the Whalecove Resort. 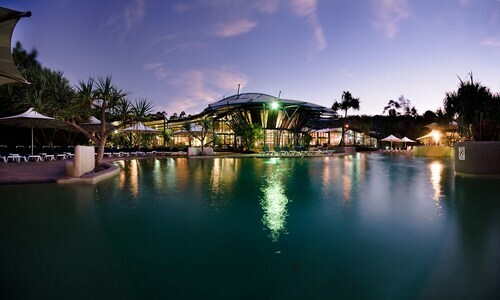 The Grange Resort is situated 25 kilometres away from the centre of Fraser Island. The Whalecove Resort is situated 25 kilometres away. Two more options are the Pier One Apartments and the Hervey Bay Motel. 30 kilometres away from Fraser Island you will find Urangan, where you can visit the Reefworld Aquarium and Hervey Bay Botanic Garden. 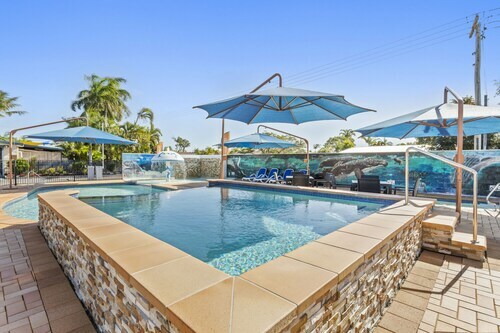 Urangan hotel options include the Woolshed Backpackers - Hostel and Kingfisher Court. Or, you could consider staying in Pialba, 35 kilometres to the west of Fraser Island, where you can pick from the Econo Lodge Fraser Gateway and Best Western Ambassador Motor Lodge. Should you choose to stay in Pialba, you might like to visit the WetSide Water Education Park and Hervey Bay Golf and Country Club. Hervey Bay Airport is the most practical airport for arriving in Fraser Island and is 30 kilometres drive from the CBD. If you plan to stay nearby, try the Best Western Ambassador Motor Lodge or the Beachside Motor Inn. How Much is a Hotel Room in Fraser Island? Hotels in Fraser Island start at AU$144 per night. Prices and availability subject to change. Additional terms may apply. Great central location. Large clean rooms. Very helpful and friendly staff. Would not hesitate to stay there again.